So chondrules is the name of the game. Thanks ! JeffreyW wrote: I have searched Electric Universe for over 3 years now and have not found anything that addresses the formation of the Earth. Firstly mainstream science has shown that once you have a theory everything you then find is forced into that theory, so you do no seem to evaluate empirical evidence properly. Secondly we were not there when they were formed so how do we really know what happened? We may have ideas but they are only guesses, especially at the moment when the EU theory and evidence has to piggy back on mainstream science experiments and observations. It depends on what you mean by "nothing in the center of the Earth?" The Earth may be hollow like a geode but for it to have nothing would imply a proper vacuum which seems unlikely and i guess you are not meaning that? If the earth is hollow perhaps it has plasma inside that may create material? Perhaps the mass comes not from the center of the earth but from near its surface - volcanoes and mid ocean ridges producing 'new' mass? Earth and the other terrestrial planets are late arrivals, forming only after the original planets of the inner solar system were destroyed, according to a new model explaining our solar system's unique architecture. So we are now back to the "Earth Solar System is unique" all over again then. The only reason it seems this weay is because we have not been out & had a look at what is really happening - I seriously doubt there is anything special about our solar system at all. It's an ordinary star like trillions of others - nothing special, nothing unique. B - so far away the light reaching us is much, much older. Incidentally, there is no valid mainstream theory of how the planets were formed in the first place - accretion from dust clouds does not stand up to scrutiny, and if anything systems with the large planets near their star makes sense as a new system we are only now seeing that will look nothing like this if visited as light takes time to travel to us. These gas giants are close to the parent star that ejected them because they are new and on the way out - not because they are old & on the way in. As usual, the mainstream has it all back arsewards. Well if the universe is infinite, nothing is unique, right? Does this sound right? A planet is measured, in comparison to its host star? If measurements of distance and consequently size are incorrect, wouldn't the planets have the same problem? Since the star is presumed to be further away than it actually is, it is presumed larger, and hence the planets are presumed larger? Unique? I think every star system is going to have its own character and story, I don't think we will ever find a star system that feels just like home, we can find something close though. "Most people think the eight planets in our solar system orbit the sun along a straight plane, like a disc on a record player. But actually, that plane is slightly tilted, and now astronomers think they know why: The elusive Planet Nine. "Earlier this year Michael Brown, a professor of planetary astronomy at the California Institute of Technology, presented evidence that there may be a massive planet beyond Neptune orbiting the sun. The so-called Planet Nine is thought to be about 10 times the mass of Earth and about as large as Neptune. At its farthest point it is about 155 billion miles away from the sun. "At that size and distance, this planet’s mass would have large effects on the other planets orbiting the sun. Well, as it it obviously turns out, the planets don't rotate in a flat plane, or in neat circular orbits, but in eliptical orbits that aren't flat. This is part of the description that is left out of the text delivered to the public. Now why is that? This is a process, it doesn't happen instantly, so if objects are still orbiting far off from the equatorial plane of some core, you can bet that it hasn't had the time to gravitate to the equatorial plane yet, but is in the process of doing so. Or, maybe something knocked it out of a more stable orbit and altered its orbit, but basically its a sign it has been disturbed recently. The milky way obviously has a spherical core (no core is a perfect sphere but its an approximation), and a disk like structure as you look outside the core, same for saturn, or any core, the faster the core spins, the stronger the centripetal force. If you don't have a strong spinning core, like in the case of 'core-less galaxies', which are just fragments from past galaxy collisions, you don't really get the disk-like shape anymore (although the center of mass of that galaxy will function as a weak core itself, it is very weak). 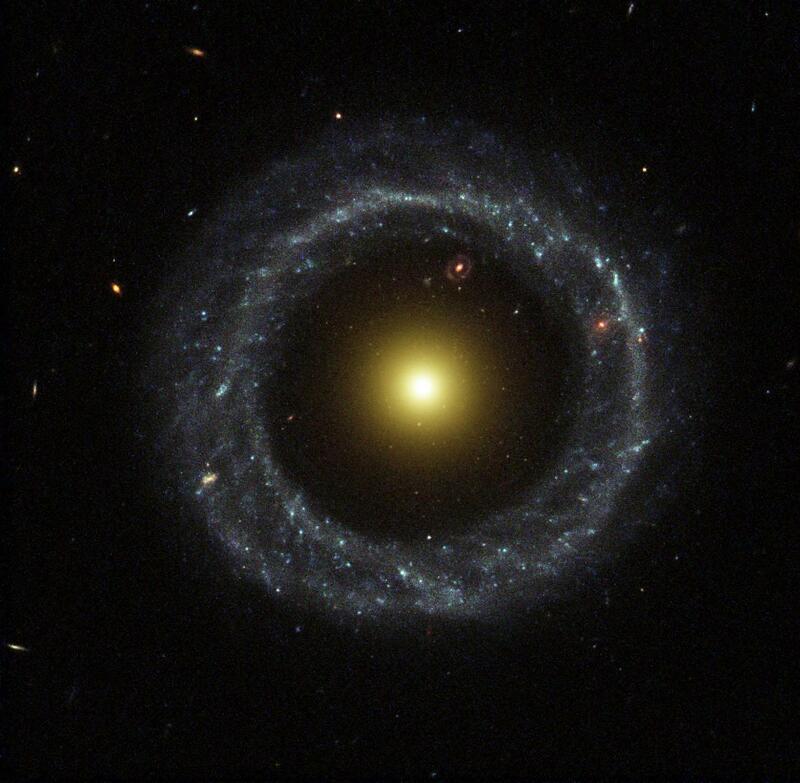 The most undisturbed, ancient galaxies are ring galaxies, and in my opinion are the most badass galaxies too. They represent the final shape of a galaxy if it's left alone (no collisions or major disturbances) for a long time. As you may notice - there is a secondary, MUCH SLOWER effect - matter gravitates away from the core due to the circular motion to make a 'ring' or band, like we see on Saturn. The milky way hasnt done this yet, its not old enough. If they find planet nine then what if is cometary. A very elliptical orbit. And then trace it's orbit backwards to, say, 12,000 years ago. I agree that the angle to the ecliptic is a sure sign of pretty recent activity, rather than this planet nine being out there for millions of years. And once you have planetary orbital shifts then that opens pandora's box. Plus the evidence of fruit salad stellar planetary systems leads to a revolution really. One has to answer the question of how, Venus, say, could undergo an orbital shift. Even if this requires a Solar System wide event, like a galactic superwave. Do Neptune size planets fire up outside the Solar System magnetosphere. Or are they cool which means there might be absolutely untold of these planet 9 size objects out there and we do not see them just as we have not seen planet 9. The Planet X people must be bursting ! kell1990 wrote: Well, as it it obviously turns out, the planets don't rotate in a flat plane, or in neat circular orbits, but in elliptical orbits that aren't flat. This is part of the description that is left out of the text delivered to the public. Now why is that? Correction: Planets revolve (travel around) around a central point; they don't "rotate", which is to turn on an axis. "The Sun rotates on its axis, while the planets revolve around the Sun as they rotate on their axes." Actually, the planets (and the Sun to a minor extent) trace a spiral through space as the Sun moves through the cosmos. It just occurred to me that if this is so, then how can the planets have formed through a process of aggregation? Wouldn't all the assorted mass be strewn behind the Sun, like a contrail behind a jet engine on an airplane? Another age guess for planet earth? I have no idea how they could find out about this. Interesting. Sounds like the age of Venus, and the cloud is between the orbits of Venus and the asteroid belt. But if one is constrained by the straitjacket of the nebular hypothesis, then Venus must the same age as the rest of the Solar system, which we "know" is 4.5 billion years old. I've read it lots of places. Are you referring to a news article or a paper? Is there a link? Good find, Bomb20, but can you contest it? Simply calling it "creationist" does not invalidate it. I first learned of the Poynting-Robertson effect from Tom Van Flandern's writings. And although Wikipedia is a standard-bearer for establishment science, they have an article on the mechanism, too. So I'll consider Poynting-Robertson a given for now. • The Oort cloud is an imaginary reservoir of dirty snowballs halfway to the next star because otherwise all the comets would have evaporated by now. • Venus is similar to Titan in that it pushes extremes that cannot have lasted for 4.5 billion years. So untenable models, like "runaway greenhouses" are dreamed up to preserve the status quo. If the argument is valid—that the dust lanes forming the zodiac light could not have lasted billions of years—that doesn't automatically mean the Earth is a Biblical 4004 years old. Consider Velikovsky: Venus as a young planet fissioned from Jupiter, an event witnessed by modern humans. Could the dust be the debris of Venus's birth? The dust runs from Venus to the asteroid belt (almost to Jupiter). Does that favor Velikovsky? For that matter, what are the asteroids? Perhaps the dust comes from EDM of asteroids and has nothing to do with Venus at all. The point is, could the zodiac light dust be a transient and "young" feature of the Solar system? Step out of the nebular hypothesis, which is a straitjacket requiring everything to be the same age.